Downtown L.A. is not only the region’s transportation hub, it’s also the hub for luxury high rise loft apartments and condos. 655 Hope is one such luxury residence and it happens to be perched right atop the Hope Street entrance of the 7th Street Metro Center Station in the heart of Downtown’s Financial District. 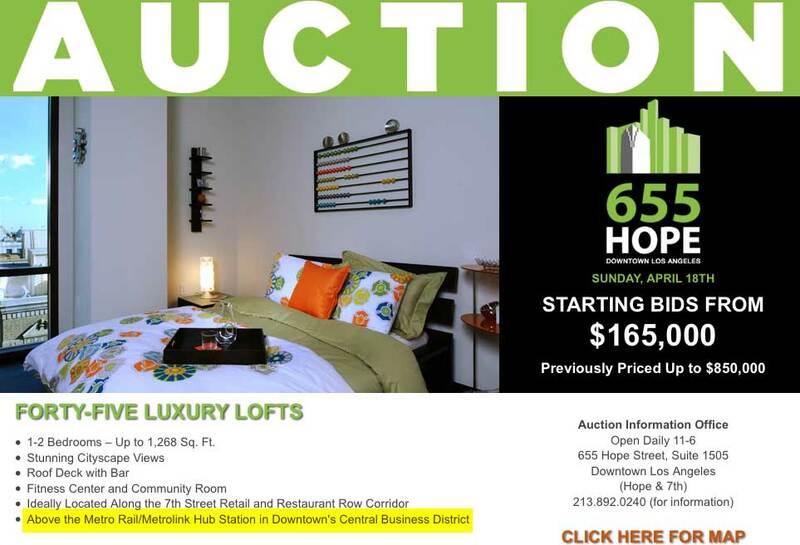 655 Hope’s 45 loft condominiums have gone up for auction as noted in an advertisement in last Saturday’s L.A. Times Real Estate/New Homes advertising supplement and on 655 Hope’s own website. The list of amenities in the advertisement includes a Metro mention, although a somewhat misinformed one: “Above the Metro Rail/Metrolink Hub Station in Downtown’s Central Business District”. While it’s true that 7th Street Metro Center is a hub for Metro Rail – the Red Line, Purple Line and Blue Line all serve the station – to claim 655 Hope sits above a Metrolink hub is a bit dubious. Downtown L.A.’s Metrolink hub is Union Station, three subway stops away from 655 Hope. Of course, someone living in the Central Business District would probably have little use for commuter rail anyhow. Nonetheless, it’s always nice to see public transit listed as an amenity for real estate and hopefully future 655 Hope residents take advantage of the awesome Metro access just below their doorsteps.